He begins: “I started this site as a way to reach out to people in the community. I thought that a virtual a cup of coffee would be a low pressure way to meet and discuss our shared ideas, passions, and vision for the profession. Then, at some point, I went a different way with it. Enjoy the angst,” proclaims Jody Brown, with a hint of madness and glee. 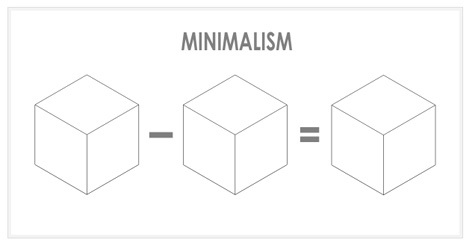 Here we start with what you might call the ‘ten stages of minimalism’ – watch and learn! Indeed one has to laugh sometimes, or risk crying otherwise, as any struggling architect knows from experience, trying all kinds of combinations simply to get to a simple solution. Coffee with an Architect takes all kinds of approaches, from serious narratives to slapstick postcards and self-deprecating visual definitions … all of this is (arguably) done with the aim of illuminating what should be (but often are not) readily-apparent facts surrounding built-environment professions. 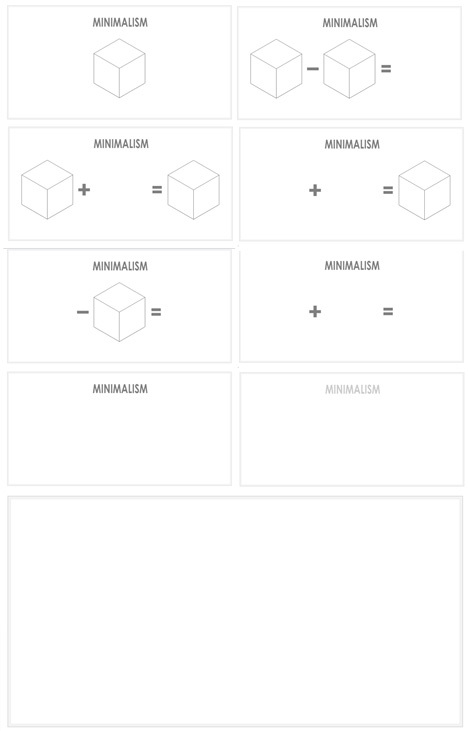 Of Minimalism he has (not) much to say, as you saw – the series of illustrations work far better than words, just like good architectural diagrams. 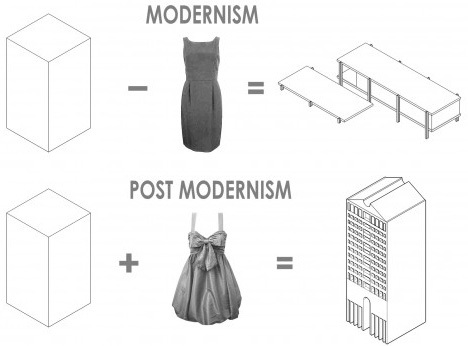 Of Modernism and Postmodernism there is an inevitable head nod to Robert Venturi’s ducks and decorated sheds. 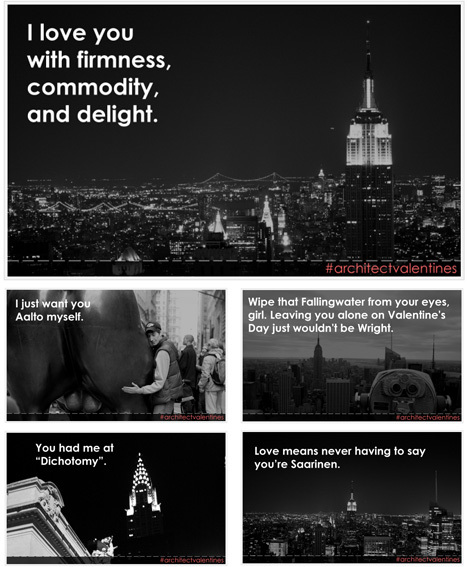 Then there are postcards from architects … and later come Valentine’s Day cards, too. 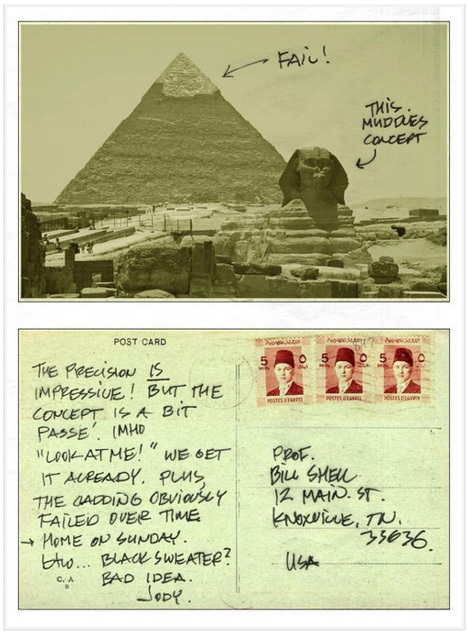 His humanist/humorist approach is, to be bold, what architecture needs – or, more specifically, what many architects need. A rich cup of coffee to wake the sense, spiced with a dollop of deep self-deprecating insight that creates an “ah-hah!” moment too often found only at the end of a grueling ten-week design studio process. Article titles like “Ugly goes all the way to the bone” and “New York I love you but you’re freaking me out” jar us into full attention with the blunt absence of pretense. He also features faux conversations he didn’t have, or no one had, with famous architects, and speculates on the things one should not say to particular past heroes of the field. “His work focuses on urban infill projects, mixed-use, urban design, and urban renewal. Over the last 18 and half years, he has built on his passion for planning and urban design, and, has worked on enhancing, adding to, re-using, renovating, and sometimes creating from scratch the places where people meet, learn, play, and become inspired. His work is grounded in the belief that Architecture can save cities. When he’s not doing that, he can be found making fun of himself and his profession, and blogging about his ideals at – Coffee with an Architect. Or, you can find him sipping coffee with someone at a cafe near you, blathering on and on about Le Corbusier, while looking aloof and interesting at the same time somewhere over in the corner. In other words, he’s just an Architect, standing in front of an ideology, asking it to love him.” Coffee with an Architect is, in short, well worth a read.